A nice and authentic rural house, situated in the nature, in the picturesque village of Montorfano. The house is a short distance from Lake Mergozzo and Lake Maggiore, which can be reached in just 20 minutes walking. The decor is simple but functional. There is a wood stove for heating. Perfect for lovers of nature and tranquility, with the possibility of visiting the lakes. The parking for the car is about 200m away. A short distance away is a nice little restaurant, recommended to taste local dishes or for breakfast. In the restaurant: Wifi internet connection available. Aanrijdend one mountain at 120 meters altitude with steep bits, we arrived in a tiny hamlet with about 20 houses and a beautiful church in 1100. So there you could by car, then walking straight up to the cottage, the last in the hamlet, so quiet. From there, some nice things done. Stresa is very nice, even chic to mention. The town Mergozzo yielded even a real beer cafe, with all Belgian beers, you do not expect it ... Even a trip to the Orthameer is very nice, because we made a nice mtbtocht. The supermarket Ibercoop is really as "a mega case, the Tigros is much nicer and more authentic. The cottage was primitive, with a nice bathroom and a lovely covered seating area. During a storm lovely to sit outside. Anyway All in all a nice had a holiday, only downside is that you do not actually go down the mountain without a car, unless you are very sporty. 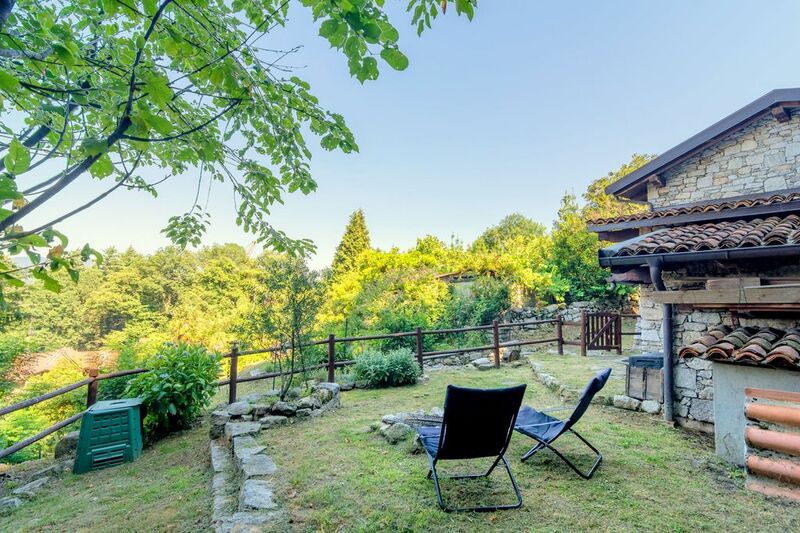 For people who love nature, can not be bothered by the occasional barking of dogs in the village and have a taste for quaint, picturesque village, the Casa Emilietta in Montofarno is an ideal holiday destination. We spent two wonderful weeks there and took willing to accept that bathroom and toilet had a separate entrance, because overall the house is furnished in a clean condition and with all the necessities. Whether you go for a swim in the idyllic shores of Lake Mergozzo, take boat trips on Lake Maggiore, wants to explore the remarkable hinterland - anything is possible from here. We were thrilled! Not to mention the restaurant located in the village - must go and carne and pesce try. A big thank you again. At Marina, who really did everything to make our stay as pleasant as possible, we provided them with vitamins from her garden and furnished us in advance with all the necessary information Mille Grazie and thumbs up! Wunderbare ruhige Lage, schöner Blick, viel Platz draußen, bequemes Bett, ganz nett eingerichtet (aber kein Sofa in der Wohnküche), ausreichende, zum Teil etwas betagte Ausstattung. Dass es im Haus direkt kein Wlan und keinen Fernseher gibt, haben wir sehr begrüßt. Die technische Ausstattung verlangt etwas Fingerspitzengefühl (nicht zuviele E-Geräte gleichzeitig anstellen ;- ); die Pelletsheizung funktioniert auf Knopfdruck, möchte aber gereinigt werden). Das Bad (nicht im Haus direkt, einmal über die Terasse laufen) wird nur mit einem etwas klapprigen Heizlüfter erwärmt, das könnte im Herbst oder Frühjahr etwas ungemütlich sein. Da das Haus als letztes im Dorf oben im Hang am Waldrand liegt, gibt es auch Insektenbesuch. Am kleinen Strand unten am Lago Mergozzo haben wir schöne Nachmittage verbracht, in der Nähe sind fantastische Wanderwege (Rio Pogallo ab Cicogna!). Für unseren Reisezeitraum im Mai/Juni war das Häuschen mit der Lage und den Möglichkeiten zu zweit toll und wirklich preisgünstig; wir kommen bestimmt wieder. It's a lovely house in a lovely village. But we don't have hotwater for the shower, and the bathroom was very cold. Marina want 80 euros for cleaning the house, but the house is very little and she don't offer for this price the towel or the cover! When I move the table, there still peanuts under! The drower of cutlery was fattish. And there's no oil, or salt or pepper. No dishwashing liquid. I think it's too expansive. But realy, the house is very cute and quiet. Marina was very sympathic on the hours to come or leave the house. We take good time! Dreckig und ungepflegt, durchgelegenes Matratzen, keine Kissen für die Holzgartenstühle usw.Die Bettwäsche des Vormieters lag noch herum. Wir mussten wegen Stauballergie vorzeitig abreisen.